The Report Card is a SchoolCity SUITE module that can be purchased separately by the district. It is designed in collaboration with the district to include standards-based grading statements and grading rubrics based on district needs. 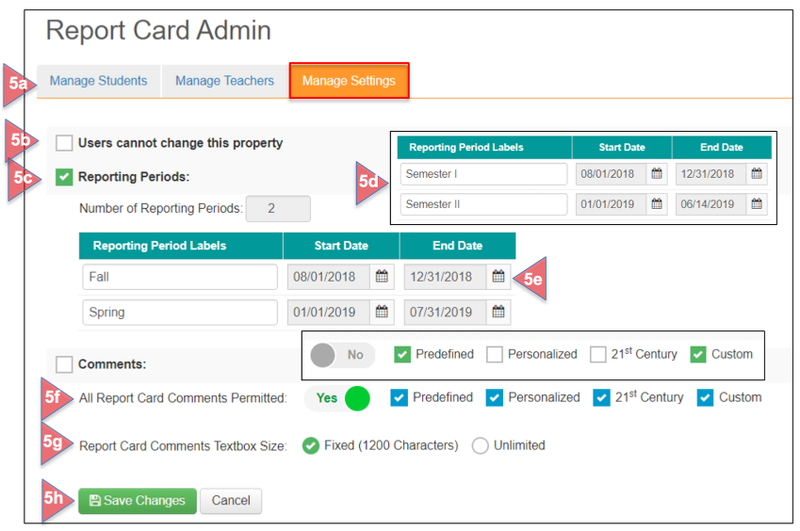 In addition, the SchoolCity SUITE includes Report Card Admin permissions that can be granted to specific District and School Level Administrators in order to manage students, teachers, and Report Card settings. 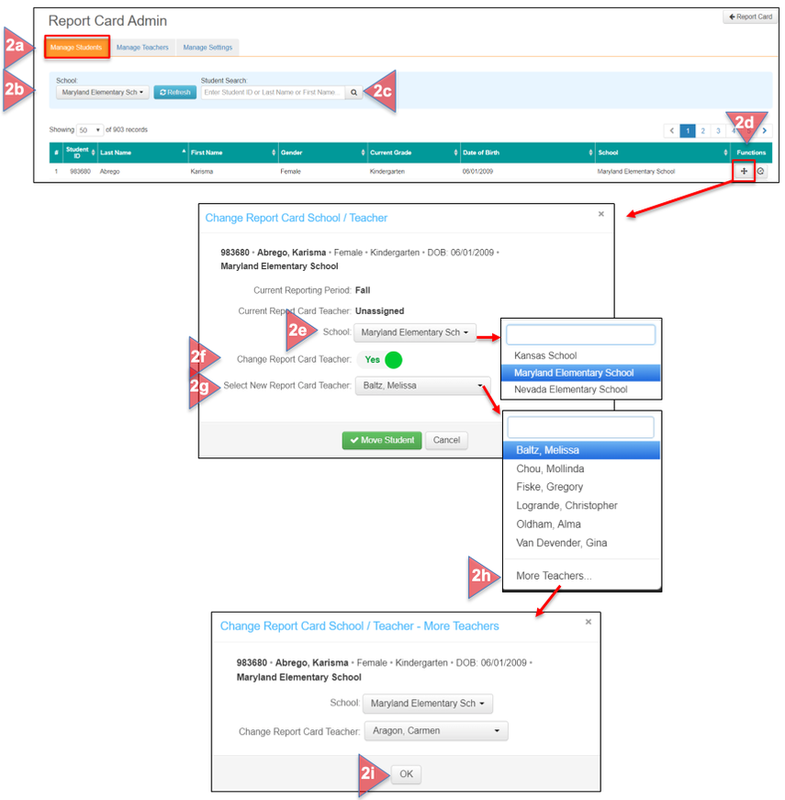 Click the grid icon to open the navigation grid menu, and select Report Card. Please see the Help document, Basic Navigation: Navigating the Launchpad 6.0, for more information. Or, click on the REPORT CARD Flip Card. On the reverse side, select View/Print/Enter Grade By Student. On the Report Card screen, select Report Card Admin. District Level users can move one or more students from one school to another and from one teacher’s roster to another within the district. School Level users can move one or more students from one teacher’s roster to another within the school. On the Report Card Admin screen, select Manage Students. District Level users: Select a School, then click Refresh. District and School Level users: Use the Student Search box to find a specific student. Enter the student’s ID number, Last, or First Name, then click on the magnifying glass icon to view the results. To move the student, click on the Move icon in the Functions column in the same row as the student’s name. District Level users: Select the student’s new School from the drop down list. District or School Level users: If the Report Card Teacher is also changing (the teacher who will complete the student’s report card), then slide No to Yes. Select the new Report Card Teacher. By default, the first set of teachers shown are those who teach the grade level in which the student is enrolled. Select More Teachers to view all teachers at the new school if the desired teacher is not shown. Select the new teacher, then click OK to continue. Select Move Student when the new School and/or new Teacher have been selected. A message will appear confirming this action. Click OK to continue. The student can be found on the new Report Card Teacher’s roster. View History of any transactions regarding a student by clicking on the History icon in the Functions column. The Activity Date, Activity, and User Full Name of the user who made changes will be displayed. Like-Grade Level Teachers can be linked within a district, within a school, or within a grade in order to “share” students’ report cards. Note: Linking teachers allows them to grade shared students; however, only one teacher can edit a student’s report card at a time. Select the Manage Teachers tab. District Level users can select a Grade Level and/or School, while School Level users can select a Grade Level. Use the Search box to find a specific teacher in the district or school. Link all Like-Grade Level Teachers within the District: Check the box to the left of the District name, and then click on the bolded Link icon to the right of the District name. A message will appear confirming this action. Click Proceed With Linking, or Cancel. A second message will appear confirming the linking of all teachers. Click OK to continue. Note that the Link icon has now changed to the Un-Link icon. (See Step 4 for Un-Linking). Link all Like-Grade Level Teachers within a School: Check the box to the left of the School name, then click on the bolded Link icon to the right of the School name. A second message will appear confirming the linking of teachers. Click OK to continue. Note that the Link icon has now changed to the Un-Link icon. (See Step 4 for Un-Linking). Link Specific Like-Grade Level Teachers within a School: Click on the green circle with a plus sign to the left of the School Name. It will change to an orange circle with a minus sign, and the grade levels will display. Check the box of the grade in which you want to link teachers, then click on the bolded link icon to the right of the grade level. View all linked teachers within the grade level: Click on the green circle with a plus sign next to the Grade Level to open the list of teachers. It will change to an orange circle with a minus sign. Teachers who have been linked will display with a green box and white check next to their name. Link two or more teachers within a Grade Level: Click on the green circle next to the Grade Level to open the list of teachers. Check the box next to each teacher’s name you want to link. (All others should have an open box next to each of their names.) Then click on the bolded Link icon in the same row as one of the teachers. Proceed as described above. All Linked teachers may be Un-Linked at any time. Un-Link at District Level: Check the box to the left of the District name. 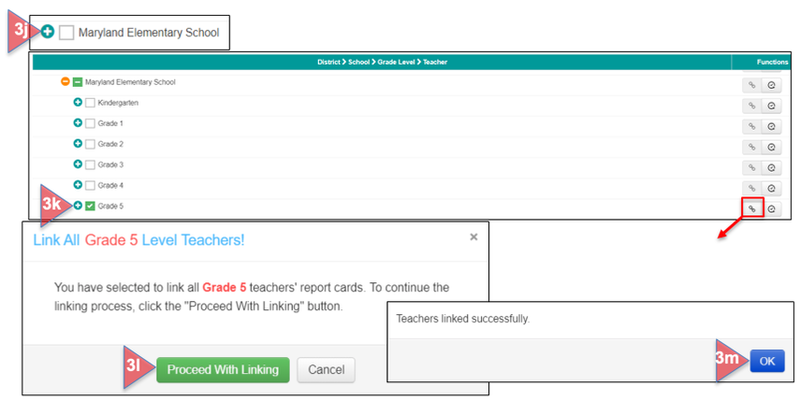 In the row with the District Name, click on the Un-Link icon to un-link all previously linked Like-Grade Level Teachers in the district. A message will appear confirming this action. Click Proceed With Un-Linking or Cancel. A second message will appear confirming the un-linking of all teachers. Click OK to continue. Un-Link at School Level: Check the box to the left of the School name. 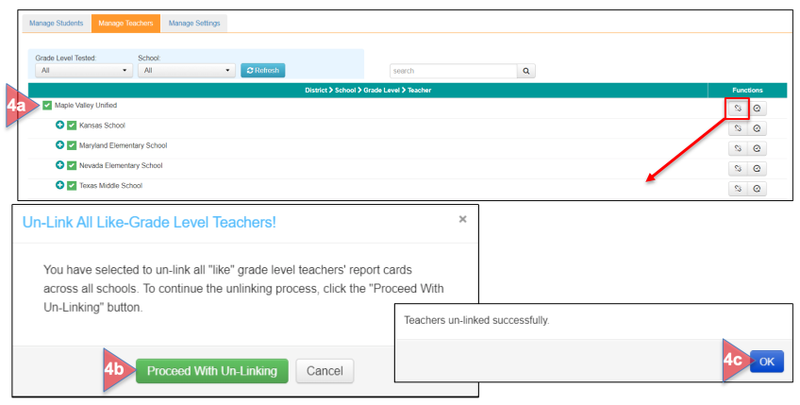 In the row with the School Name, click on the Un-Link icon to un-link all previously linked Like-Grade Level Teachers in the school. Proceed as described in 4b and 4c. Un-Link at the Grade Level: Open the School list by clicking on the green circle. Check the box next to the Grade Level. In the row with the Grade Level, click on the Un-Link icon to un-link all previously linked teachers. Proceed as described in 4b and 4c. 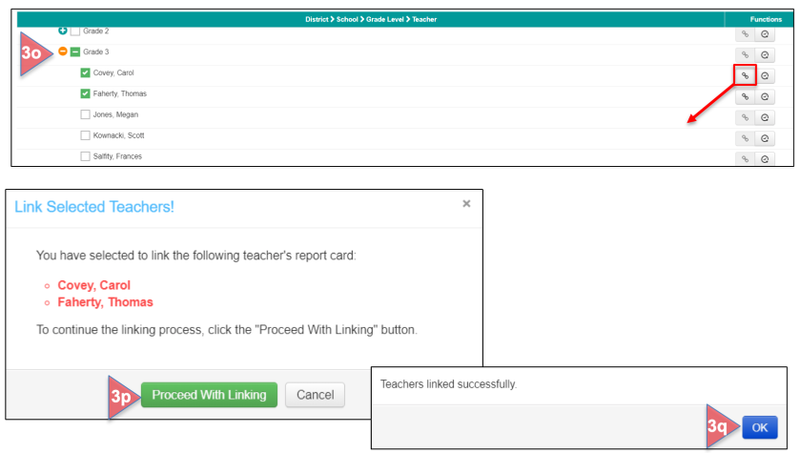 Un-Link at Teacher Level: Un-Link teachers within a Grade Level by clicking on the green circle next to the Grade Level to display the teachers. Click on the Un-Link icon to the right of one teacher’s name. Proceed as described in 4b and 4c. This function provides access to the Report Card settings in order to make revisions and edits. Settings made at the District Level apply to all users within the district. Settings made at the School Level apply to all users within the school. Select the Manage Settings tab. Users cannot change this property: Check this box if you want all properties to be un-editable. All settings will be the same for all users. Or, check the box next to a property to make that specific one un-editable. Reporting Periods: The Number of Reporting Periods is set by the district and cannot be changed. Reporting Period Labels may be changed. Click inside the label box and rename. For example, Fall can be changed to Semester I, and End-of-Year can be changed to Semester II. Start Dates and End Dates may be changed. Click the calendar icon next to the date to change it. Note that Reporting Periods may not overlap. If the ending date for the first period is changed, the beginning of the next period will automatically change to the following day. All Report Card Comments Permitted: If No, check only those comment types you want to enable (shown with a green box and white checkmark). To enable all comment types, slide No to Yes, and all comment types will be shown with a blue box and white checkmark. Note: For more detailed information about each of the Comment Types, please see the Help document, Report Card: Entering Comments. Report Card Comments Textbox Size: Determine if the size of the comments textbox on the Report Card should be fixed at 1200 characters or unlimited. If unlimited, it may affect the length of a completed and printed report card. Save Changes or Cancel: When all edits and selections have been made, click on Save Changes. Confirmation message: This will confirm that all settings have been saved. Click OK to continue. To learn more about report cards in SchoolCity, see the guides in SchoolCity, Report Card.